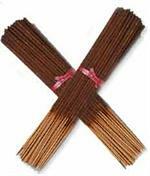 As distributors of Wildberry Incense, we offer 11" Wildberry Incense Sticks, Wildberry Incense Cones, and Wildberry mini sticks. These incense are made of higher quality more expensive fragrances. More fragrance is used per stick or cones, and a proprietary fixative keeps the incense fresher longer. Fragrances smell on the stick or cones as they do when the are burnt.